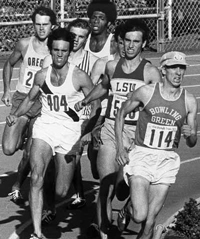 Known as much for his omnipresent golf hat as his strong finishing kick, Dave Wottle used the 1972 Olympics to gain national celebrity while still a student at Bowling Green. Born on August 7, 1950 in Canton, Wottle won a state title at Lincoln High School, then burst onto the local and national track scene at Bowling Green in 1970, finishing second in the mile at the NCAA Track and Field Championships. While injuries kept him out of the 1971 season, Wottle had a career year in 1972, just in time for the Olympics in Munich, Germany. After winning the 1500m title at the NCAA Championships, Wottle also won the 800m race at the AAU Championships. Then, on July 1, 1972 at the Olympic Trials in Eugene, Oregon, Wottle ran the 800 meters in 1:44.3, tying the World Record, and breaking the six-year old American record in the process. The next two months were ones that would change anyone's life. On July 15, he got married, and about six weeks later was in Munich for the Olympic Games. The Games started with their usual fanfare, and Wottle had everyone's attention as he took to the track for the 800m race. He started slowly, falling behind the pack, momentarily changing his goal from winning the race to simply saving face. Determined, Wottle caught up to the pack, and changed his goals for the race again. "When I passed the first Kenyan (one of the front-runners), I quickly reassessed my goals and decided to go for a silver medal," he wrote on the Rhodes College website, where he currently serves as Dean of Admissions and Financial Aid. With another Kenyan and a Russian ahead of him, the "guy in the hat" put on a kick that pushed him to Olympic gold. He crossed the finish line three-hundredths of a second ahead of Russian Yewgeniy Arzhanov, and not much more than a tenth of a second ahead of Kenyan Mike Boit, who took the bronze. With one medal secured, Wottle was preparing for the 1500m race, when the Olympic spirit was shattered. On September 5, just six days into the games, eight Arab commandos raided the athlete's village in Munich, killing two Israeli athletes and taking nine others hostage. The next morning, all nine hostages were killed in a shootout between the terrorists and police at the German airport. After a day of mourning, and a memorial service at the main Olympic stadium, the Games continued. Wottle, however, was eliminated from competition in the semifinals of the 1500 meters, and would not have a chance at another medal. He would return to BG for the 1973 track season, and again was a force at the NCAA Championships. Not in the 800 meters in which he held the world record (until May 27 of that year, when fellow American Rich Wolhuter would eclipse his mark by three-tenths of a second), but in the mile, where he closed out his collegiate career with another first place finish. All told in his collegiate career, he would win the two NCAA outdoor titles, scoring in another, win three NCAA indoor events, and scored in an AAU outdoor event in addition to his win in the 800m in the 1972 AAU Championships. In the Mid-American Conference, he won six titles in track, one in cross country, and also won an All-Ohio cross country meet and scoring in an NCAA cross country meet. By the time he left Bowling Green, he had set 13 Ohio college records. Inducted into the Ohio Track Hall of Fame in 1974, and the USA Track and Field Hall of Fame in 1982 (incidentally, five years after his famous hat was "inducted"), Wottle coached track and cross country at Walsh and Bethany colleges for six years, and is currently employed at Rhodes College in Memphis, Tennessee.